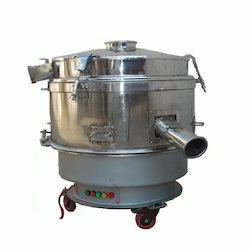 Supplier & Manufacturer of Sifter Machine. Our product range also comprises of Powder Coating Plants, Pre Mixer Powder Coating Machine and Twin Screw Extruder. We are engaged in manufacturing Sifter Machine that is extensively used for separation of solids and gradation of material in accordance with their sizes. These are thoroughly tested for precision, quality and durability and operate on the principle of powder trembling and interacting. Further, these are suitable for both solid-solid and solid-liquid separation applications. Looking for Sifter Machine Powder Coating plant ?